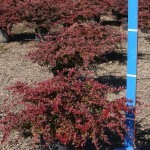 A low spreading shrub with bright orange new growth, that ages to burgundy. The branches are slender, spiny and small. Small yellow flowers in spring are followed by small bright red berries in fall. Performs well in most soils, as long as they are well-drained. The color is best in full sun. Useful as a groundcover or for mass planting.